The Marks of Secret is the fourth installment of Suzanne Collins’ Gregor the Overlander series and takes us for another adventure in the Underland. The series is centered around an 11 year old boy from New York City who does his best Alice impression by falling down the rabbit hole and finding himself in a subterranean world. In the Underland, humans exist along side giant, talking creatures (rats, bats, cockroaches, mice, and more) and there is an constant struggle for power. Gregor discovers he is the center of a set of prophecies about an Overlander warrior who is key in the future of the Underland. In the first three books, there was a resolution to the conflict and Gregor returned home, but in Marks of Secret, Collins takes the reader along for a ride that resembles a Peter Jackson movie. Collins does a great job creating a fantasy world and has the reader buying into talking cockroaches and a boy with no real training becoming a raging warrior. I care for the characters, empathize with their plight, and feel like I am along side on this adventure (much in the way I cared for Katniss). While there is no bow tied around the story, the set up is perfect for the finale to be delivered in Book 5. I am totally hooked into discovering what the story heading, what is the final prophecy and will the rats be stopped. At the same time, I found myself feeling conflicted about how much I really enjoyed being on the ride in Mark of Secret. There is plenty of action in the 320+ pages and each leg of the journey is great by itself, but much like the Lord of the Rings movies, I after following each harrowing scene and near death experience I was a little disappointed to be told it ain’t over at the end – total book tease. Is it worth taking the time to read this adventure knowing you will not get closure? The answer is still a resounding YES. 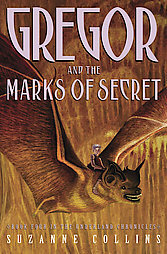 If you loved Collins’ Hunger Games series, you will enjoy Gregor series, including Mark of Secret. Hope you enjoy your fall into the rabbit hole.